Style is a story about overcoming adversity and keeping yourself nice no matter what the temptation. From the opening titles sequence showing disabled kids dancing, the message is there – Dance is joyous and belongs to all. It is a traditional aspirational tale of a boy from the disadvantaged side of society achieving his dream, of a man who overcomes tragedy to find triumph and the power of love in all its forms. Written and directed by Lawrence, who also stars and choreographs, Style is a dance extravaganza with something for everyone’s tastes. Prabhu Deva is Ganesh, a star of the dance competition circuit. He has won high profile dance competitions and his future seems assured. 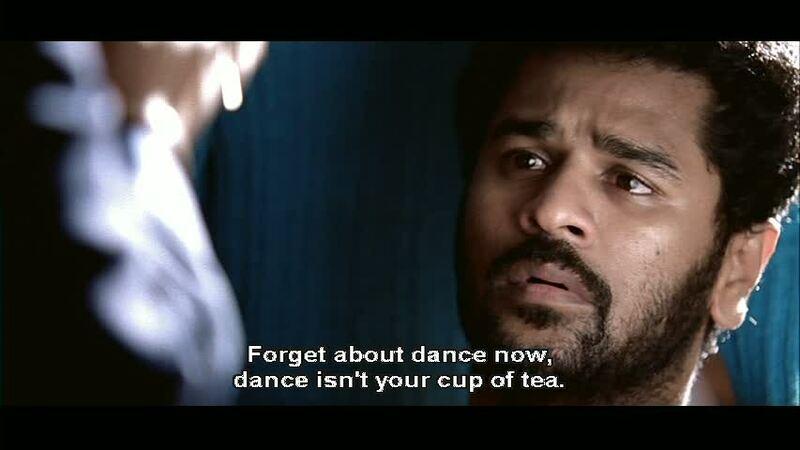 We will tell you now – we love Prabhu Deva. He is a lanky, unlikely looking hero who is transformed when he dances. His main rival in these competitions is Anthony, and we first see Ganesh beating Anthony to a place in the regional finals. Anthony (he is evil – we know this because he has a spiral perm and sneers a lot so we will call him Evil Anthony from now on) and his crazy brother (with terrible cornrow braids) put paid to their rival’s dancing days in a rigged accident which causes Ganesh to lose both his legs. Anthony will be recognisable as that backing dancer with the long permed hair from many Hindi films. Of course Ganesh’s sponsors desert him as he can no longer dance, and to add insult to injury, Evil Anthony becomes the new regional champion by default. Raghava, rather endearingly and totally understandably, is obsessed with Chiranjeevi. The presence of Megastar Chiru, real or imagined, sparks some of the best and funniest scenes in the film, including a fight sequence worthy of Jackie Chan. Lawrence has a likeable screen presence and is certainly suited to the physicality of the role. We believe that the best dancers also excel in the fight scenes as they draw on their gymnastic abilities and timing rather than just relying on muscle. And he is such an amazing dancer that some of the more incredible plot points don’t matter so much. Ganesh is depressed and frightened of what his life will be without dance and of being dependant on his younger sister for support. Raghava is oppressed by lack of opportunity but determined to keep trying to fulfil his dreams of a mother and a career. After a pep talk by his sister, Ganesh determines that he will find new dancers to take on Evil Anthony and his nasty looking backing dancers. After some depressing but very funny auditions (think Agadoo), Ganesh finds Raghava and crew performing a tribute to his last dance routine on a TV dance show. Destiny has got its act together at last! There is also some romance in the air. Shruthi, played by Charmi, is a student at the Western Dance School where Raghava cleans. He should have known she was the wrong girl after seeing her audition to Britney’s “Oops I Did It Again” complete with wardrobe malfunction. Raghava went to her rescue and was instantly smitten. We see his heart break as Charmi reveals she has been using him to make her college friend Raja jealous enough to express his feelings. Oblivious to the damage she has done to Raghava, she offers him the first wedding card for her upcoming marriage. Raghava and the boys move in with their guru, and undertake an exhausting training montage. Ganesh’s sister Priya, played by the lovely Kamalini Mukherjee, develops feelings for Raghava as she sees how he treats her beloved brother, and his amazing dance style. Raghava remains oblivious to Priya, who is a classical dancer, for much of the film despite her well-mannered flirting and her romantic daydreams. Hitting the big time means big money, and to compete the guys need sponsors – the sponsors that had deserted Ganesh. A quick trip to the local discotheque with a dance off to show their Style, and they manage to gain the support they need. Success is beckoning and spirits are high! But this is a film and things cannot run so smoothly for our clean living heroes. Tragedy strikes, and darkness looms in the guise of spiral-permed Evil Anthony who is determined to win at any cost. Before the big competition Raghava’s friends are kidnapped by Evil Anthony’s even more evil brother. The only person more evil than these two guys is their hairdresser. Raghava tells Ganesh they have gone to the temple as he has been told to keep their whereabouts a secret if he wants to ever see them again. The competition has started, the boys are needed to dance, Ganesh and the sponsors are frantic. Time for one of the big guns – Nagarjuna! Somehow (we never know how) within minutes Nagarjuna finds the factory where the boys are being held hostage, rescues our heroes and gets them to the dance competition in time to compete. There is a minor detail of star performer Raghava having gunshot wounds to his legs, but that cannot stop him. It was a very nice touch by the makeup team to make the bloodstains on his costume get bigger the more he danced, and also to provide a small pool of blood at his feet as the competition progressed! They are not out of peril yet. A further attempt to remove them from the competition is thwarted by CHIRU! The time for the final dance-off is nigh and of course it comes down to the good guys of team Ganesh versus the black pleather clad Anthony. We were quite concerned by the flimsy dancefloor that seemed to buckle under the impact of Lawrence and his flying feet but after surviving heartbreak, thugs and guns we knew it would take more than that to stop him. Who will win? Do you need to ask? Dance is the winner! Heather says: I love the idea behind this film; that you can overcome all of your difficulties if you can face them with courage. The dancing children at the beginning were such a testament to the power of music to inspire everyone to dance no matter who you are or your situation in life. And as this has always been our philosophy that dance will cure a myriad of ills, it really is a favourite film. This is everything a movie about dance should be. It focuses on the love of dance and how this can touch on every aspect of life. Ganesh and Raghava both live to dance, and it shows in the joyous nature of their performances. Every dance style is there, from classical to hip hop, and everything in between! High points of this film for me are a hero who worships Chiranjeevi, a song dedicated to Chiranjeevi and a guest appearance by the man himself! And of course the number and quality of the songs. The dancing in this film is almost a character by itself and the double of Prabhu Deva and Lawrence makes for some great performances. The other dancers do really well to keep up, and the children are just great. Although I love the dancing in this film and think the performances are fantastic, I am deducting points for the slightly silly plot. 4 stars from me. Temple says: Style is such a fun film to watch. It has great songs and dancing, and a real sense of joy about dance. It’s a cliched story, but it works, and has me cheering for the good guys every time. There are many little tributes throughout the film – Michael Jackson’s influence is apparent, but there are nods to MC Hammer, Fred Astaire and of course South Indian film heroes. I love watching Prabhu Deva. He is a genius and his joy in dancing is contagious and uplifting. I am a big Fred Astaire fan, having grown up watching his films with my grandparents, and there is a similarity in that both men are plain and unprepossessing until they dance – and then they transform into charismatic, amazing, radiant stars. I was curious to see if Lawrence could carry a film. It’s a big leap from being a featured dancer or choreographer to holding an audiences attention as a hero, and I think he tailored this film to really show his strengths. The supporting cast is good, and the humour is well embedded into the plot so there isn’t a clunky comedy track to bog the film down. I will never object to a film that wants to feature Chiranjeevi, especially when his appearance is an affectionate and humorous send-up of his own legend. Style is a simple story, told fairly well, and boosted by some fantastic performers. I give it 4 stars. This entry was posted in Tollywood and tagged Charmi, Chiranjeevi, Chiru, Evil Hair, Kamalini Mukherjee, Lawrence, Lawrence Raghavendra, Prabhu Deva, Raghava Lawrence, Style, Telugu, Tollywood. Bookmark the permalink. As long as you don’t start taking fashion & style tips from him, you should be OK 🙂 Say hi from us! A gym coach! He really is evil then :)! We have to ask – does he still have the same hairstyle? I dont take fashion from him.. infact hate that kind of fashion.. I am always simple 😛 This movie was way back in 2005 I think.. btw he again had the same hairstyle for Jhummandi Nadam ( *ing Manoj ) .. I used to see him in the gym with the same style and was EWWWW what kind of hair is this.. Excellent review! “The only person more evil than these two guys is their hairdresser” and the Wiggles comparison made me laugh for several minutes. This is one of many Telugu films that I really wish had been made in 3-D. And I really appreciate the overall approach to people with disabilities. Although now that I’ve had to actually learn the choreography I think we may be a little more circumspect in what we suggest you watch! Thanks for the review Heather and Temple! Love your work. I love this film too. The dancing is fabulous and I am quite a fan of the excellent although ‘slightly silly’ (nicely understated Heather) plot though think that deserved an extra point, not a deduction. And thank you for making explicit, the evilness of a spiral perm. That point alone contains advice to live by.